"Open Two Factor Authenticator" is an open-source project aims to bring two-factor authentication to browsers and smart phones in a secure but sync-able way. All the keys are stored in a local directory, hence they are sync-able; though all local key files are highly encrypted. What is Open Two-Factor Authenticator extension and how does it work? Open Two-Factor Authenticator is one-time token generator for web services that require Two-Factor Authentication. After installation, open the UI and select a master password for your keys. You can also select a destination directory to be used for key storing. This directory can be used by all instances of the application to gain sync capability. Remember the master password is the only way to decrypt the key files. If for any reason master password is forgotten, there would be no way to access your key files anymore. After login you will see a big plus button. Press this button every time you want to add a new token to the repository. There are three ways of adding a new token. Add an screenshot that contains the QR code. Usually web services provide a QR code instead of directly providing the token string. Use the "Add an screenshot" tab to decode the image and save it to the repository. Scan the QR code: If you are on a mobile device where you can scan the QR code, use this option to directly scan the QR code from an screen. When token is added to the repository, you will see a new item is appended to the main window. Selecting this item will generate one-time token for you that can be used for login into the provider's web service. Two-factor authentication (also known as 2FA or 2-Step Verification) provides identification of users by means of the combination of two different components. These components may be something that the user knows, something that the user possesses or something that is inseparable from the user. Only the correct combination of a password and a PIN (personal identification number) allows to secure web access. Two-factor authentication is a type of multi-factor authentication. 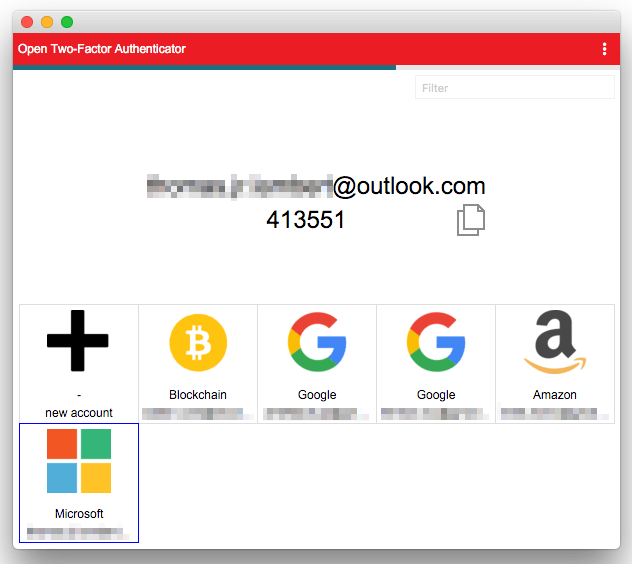 How can I enable two-factor authentication on Google, Microsoft, Evernote, or any other web servies that support two-factor authentication? To enable two-factor authentication on Google please visit https://www.google.com/landing/2step/. For Microsoft account visit http://windows.microsoft.com/en-us/windows/two-step-verification-faq. For your Evernote account please read this blog post. for other services, Google "two-factor authentication" along with the name of the service. How secure is Open Two-Factor Authenticator? Open Two-Factor Authenticator encrypts your secret key along with some other info using AES-CBC algorithm. The generated binary string is then stored locally in a plain text format (after base64 encoding). Using this method, all your credentials are stored locally and are accessed within multiple devices, and still the credentials are safe. How can I sync multiple instances of Open Two-Factor Authenticator? After the first run, there is a browse button labeled "Custom Repository". Select that button and point the application to the folder where your credentials are stored. If Open Two-Factor Authenticator finds at least one encrypted file in the directory, the UI changes from registering mode to login mode. Now you can enter your old passkey and have access to the token. What does happen if I forget my master passkey? There is literally no way to have access to the credentials if master password is forgotten. It is highly recommended to generate backup codes to be able to login to the web service and request a new QR code. To generate backup codes for Google account visit https://support.google.com/accounts/answer/1187538?hl=en. What does happen if I enter a wrong master password? Nothing! Simply you wont see the added accounts in the token window anymore. Actually you can have more than one master password for a single repository. This way, only accounts that are successfully been decrypted with the passkey are only shown after login. Is "Open Two-Factor Authenticator" going to remember my master password? No, your master password is not going to be save. By default the extension erases the password after 5 minutes of being idle. Why I cannot see my accounts anymore after entering the master password? You are entering a wrong master password. Simply close the application (or press the "Exit" button) and re-open it and reenter the master password. How can I sync "Open Two-Factor Authenticator" on Firefox for Android with the desktop version? You need a file syncing software that allows offline file syncing on mobile devices. Then copy all your credentials from the original directory and paste it in the sync-able directory. Now point both instances of Open Two-Factor Authenticator to this directory.